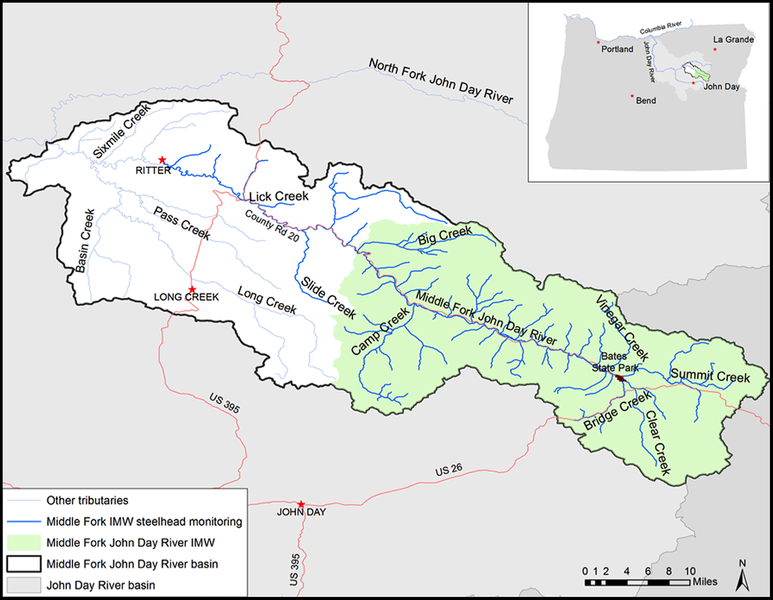 The Middle Fork John Day River Intensively Monitored Watershed (Middle Fork IMW) is a long-term, large-scale ecological research project located on the Middle Fork of the John Day River in Grant County, Oregon. ﻿We are part of a network of IMWs throughout the Pacific Northwest designed to measure the effects of river restoration projects on salmon and steelhead. We examine if and how river restoration improves fish habitat and fish populations. We are learning how we can improve future restoration projects to get the best cost-benefit. In the Middle Fork IMW we focus specifically on how restoration impacts spring Chinook salmon and summer steelhead, both of which are in decline. The IMW brings together a wide range of interests made up of local, state and federal agencies, academic institutions, private landowners, tribal entities, ranchers, environmental and community groups, and recreationists.